Along with seaweed, fish has been used as a fertilizer for centuries. But where using fish as fertilizer has liquid seaweed beat is in the nutrients it contains, especially nitrogen (N) and phosphorus (P). N and P are two important elements that are often deficient when our gardens aren’t yet up to a point of cycling nutrients optimally (which is most of the time). Nitrogen. Is the building block of proteins in plants, and so ultimately proteins in our body. We don’t need all that much nitrogen in the garden, but we do need a quality source, and that’s where liquid fish fertilizer comes in. Phosphorus. This element is important not just for root growth (as is the common myth), but it’s central to photosynthesis and building carbohydrates, and it’s involved with transporting almost every other mineral throughout the plant. Without phosphorus, our plants just aren’t going to be very healthy. 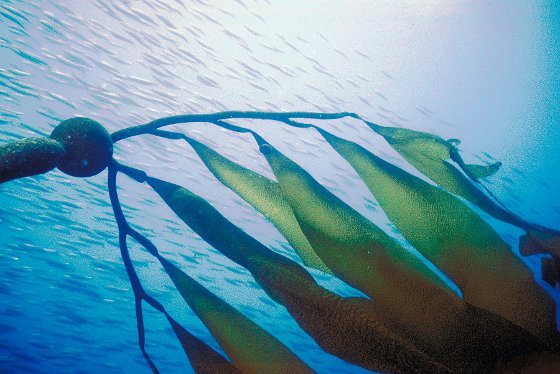 Seaweed has nutrients, too, but we especially use it for the natural plant growth regulators, whereas with fish fertilizer, it’s more about the nutrients. Plus, if you get a quality fish product, you’ll be getting oils and proteins that feed microbes – that’s why I think of it as true whole food nutrition. As with seaweed, I generally prefer a liquid fish fertilizer as being the most economical when compared to a fish meal. Fish and seaweed work really well when combined together in a fertilizer application. This is some smelly good fun! Get some fish (ocean fish is much preferred, but any fish will bring in at least some benefits) and grind it up in a blender or food processor. You’ll need a solid machine to break through the bones. Add water to cover the mixture and then process some more until it’s all blended up nicely. There you go – you have a basic liquid fish fertilizer. Now, you could use it right away by mixing it with 10 parts water and watering plants. But to get much more benefit, you should ferment it further so the nutrients will be more available for plants. For that, I use 1 teaspoon of SCD/EM per cup of fish/water mixture, but if you don’t have that around and you’re a real do-it-yourselfer, other kinds of probiotics will offer at least some help. Yogurt or kefir or some other lactic acid culture are good choices – use the same ratio as for the EM above. Or if you have a probiotic supplement, that will offer something too. Then add 1 teaspoon of sugar or dextrose per cup of fish/water to give the microbes an energy source. Put the whole mixture into a container with a lid or towel over the top, but don’t tighten the lid because there will be gases produced that would cause the container to explode. So just leave the lid slightly off, or use a carboy that allows gases to escape without oxygen getting in. After a month or two, the horrible smell will be gone, which means the fish has been consumed by the microbes and your fish fertilizer is extra special and ready to go. It will be much more beneficial than the fresh fish fertilizer at this point because the microbes have made the nutrients more available to the plants. A liquid fish emulsion has had most of the fats and proteins removed for use in other products (like fish oil supplements and pet food) and also denatured because of the high-temperature cooking process used. That high temperature destroys a lot of the beneficial components of the fish. Also, chlorinated city water is generally used, so the end product is often very high in chlorine – not good for plants and microbes. An example is the (unfortunately popular) ‘Alaska Fish Fertilizer’ made by chemical company Lilly Miller. A hydrolyzed fish fertilizer is going to retain all that good stuff because it’s done at cooler temperatures, using enzymes, so it retains its vitamins, amino acids and enzymes. A good hydrolysate will have this done before all of the bones, oils, etc. have been removed, when the fish are still fresh – that also means it doesn’t smell bad, or at least not as bad as an emulsion that uses rotting fish. Note that some companies will create a liquid fish emulsion fertilizer and then add enzymes back in after so they can call the product ‘hydrolyzed,’ but still, many of the beneficial components of the fish will have been destroyed or denatured during the processing. Now, you won’t see anyone else who sells a hydrolysate saying this, but I actually don’t want to imply that a fish emulsion is useless – it generally has a higher nitrogen number and can be beneficial for soil applications. But a fish hydrolysate is more of a whole food and is definitely better for encouraging beneficial microbes and for foliar feeding. I should also mention fish meal fertilizer. It’s a great soil additive, but it’s really expensive, especially when shipping is factored in. Any kind of liquid fish fertilizer is going to be much more cost effective than a fish meal fertilizer. 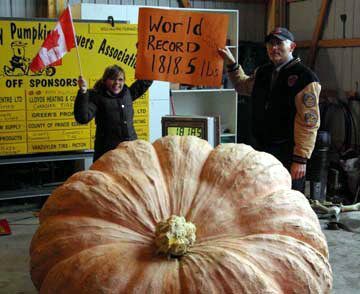 This world record pumpkin was grown with my liquid fish and seaweed. I’ve experimented with several of the best liquid fish hydrolysates on the market and I’ve been happy with most of them. 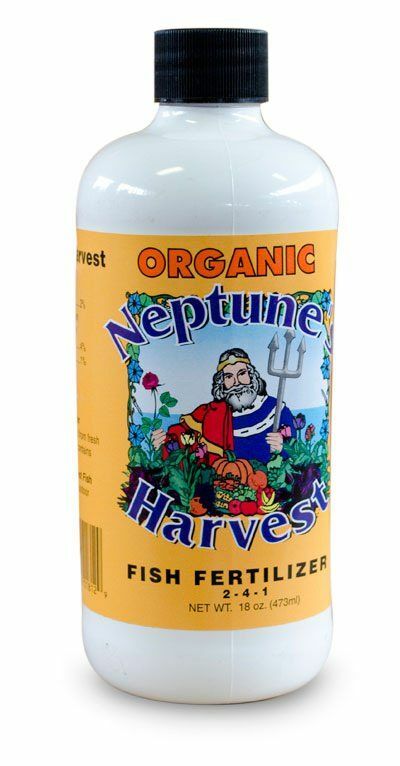 I settled on the organic fish fertilizer I use now called Neptune’s Harvest because even though it’s a little more expensive, it’s much more nutrient dense so the application rate is much lower, making it a better deal in the end. Plus they do a great job of properly processing the fish to retain all the beneficial components. The fish come from the deep, cold waters of the North Atlantic ocean, not near the polluted shore. There are freshwater fish liquid fertilizers available, but that misses the point because it’s ocean fish that are full of micronutrients, due to the fact that they live in the nutrient-dense ocean. With this product, once the fillets are removed for human consumption, the rest is made into the fish fertilizer. It used to be dumped back out in the ocean and was actually creating a dead zone, but they’ve found a way to make good use of it. I’m very concerned about the overfishing of the oceans, but the way they’re taking this byproduct of fishing that was causing environmental problems solves a lot of the problem for me. But it certainly could be argued that it’s creating yet another reason to continue fishing the oceans, which is a valid point. The reason I haven’t stopped using it is that it’s just so beneficial for the garden, and if a little bit of ocean fish helps my organic garden produce more food – and much more nutritious food – I think it makes a lot of sense. As with almost all organic liquid fish fertilizers, they’re using a touch of acid to drop the pH because otherwise the microbes in the product would get so active that the container might explode. In this case it’s phosphoric acid, the same stuff they use in soda like Coca-Cola that is really not good for us to be consuming, but in the garden, it is VERY useful. This little amount is allowed in organics (indeed this product is OMRI-Listed), and I would strongly prefer to have it in there than not. Shake the container well before using because sometimes there’s a thick part that separates out. I use 1/2 cup of liquid fish fertilizer per 1000 square feet every month, or if I’m also using sea minerals fertilizer, I alternate them every other month (eg. fish in March, sea minerals in April, fish in May, etc.). Mix it with at least 50 times as much water, which is 1/3 cup (5 Tbsp) per gallon of water, or 3 gallons of water for each 1 cup of fertilizer. If using a hose-end sprayer, it helps to mix it with some water in the sprayer to make sure it gets through the sprayer okay. Provides many benefits, but is especially known for providing nitrogen and phosphorus that promote rapid plant growth, as well as the complete fats and proteins that microorganisms need. Is a hydrolysate, processed with enzymes at cool temperatures in order to retain all of the beneficial components. Is organic, OMRI-Listed, and not even too smelly. Hi Phil, I’m just a little concerned with using ocean fertilizer products due to the fact that most of the oceans have pollutants, as well as nuclear. For this reason I do not consume any fish or sea products. What are your thoughts? Great question Rick. I was very concerned about the nuclear issue, too, so I did some digging and I’ve now come to believe the danger has been overblown. Certainly in the water by Japan there is much toxicity right now, but it seems it is not making its way to the U.S. in high concentrations as is often reported. It really seems to be an acceptable amount coming over here. I’m pretty strict about this kind of things and I’m all for the precautionary principle, but I believe this isn’t something we have to worry about.As for fish, like you, I don’t eat it, due to heavy metals and other issues, but I am not so concerned about those heavy metals transferring from the fertilizer to the food I grow. It’s definitely something to think about, but I’ve never been able to find any good information about what would be considered acceptable levels of heavy metals in these kinds of fertilizer products. You can find the levels online – I just don’t know how much of them will transfer to food. Note that most of my products are OMRI-Listed for use in organic production, including this fish, which makes me feel better about using them, although I’d still love to learn more.I do tend to use my sea minerals fertilizer a little more than the fish these days, just because I believe it’s more sustainable. And while heavy metals do end up in fish, I don’t worry about it in the ocean water fertilizer. They are present only at very small levels there, because they don’t get concentrated like they might in fish.Hope that at least partially answers your question. Perhaps some day I’ll write a blog post with more detail. If it’s the same Sea Minerals product I’ve been using for the past 12 years, then it is from the Sea of Cortes and harvested from the salt that collects in inland pools on the shores of Baja, Mexico. Dr. Murray chose this location due to the greatest diversity of sea life and the highest concentration of Sea Minerals. I’m referring to the dry product. I don’t know where they collect the Liquid version. I much prefer the dry over the liquid. It’s much more cost effective as I don’t have to pay for shipping costs on the 8 lbs. of water per gallon of product. A 1:50 dilution should be plenty diluted (5 Tbsp per gallon of water). White fuzz is probably a mold, usually because of overwatering. It’s not necessarily the end of the world, but definitely nice to not have it there. If watering less doesn’t help, you might want to re-pot in new soil. Spraying EM/SCD Probiotics might help, too, or top dressing with a bit of good compost. Thanks Phil! The white fuzz is only showing up on the soil of the plants that received both seaweed and fish fertilizer combined together. Some received only the seaweed fertilizer and they have not developed the fuzz. All the plants have been watered the same amount, so I am just curious about why there is a difference?Also, just to clarify…is the 1:50 dilution for the garden plants also? Or just for the seedlings? I believe the bottle says 10 ml per 100 ml for soil application. Just wanted to check that with you.Thanks for the great site and advice! Oh, that’s interesting about the mold being caused by the fish. It is known to be a good fungal feeder when making compost tea, so I could see it encouraging the mold. I suppose applying with a higher dilution and/or applying less often might curtail that, or just foliar spray instead.You can certainly follow their recommendations for dilution rates. I had come to 1:50 by looking at their farming rates, but I know they actually promote a higher dilution (1:128 for the garden and 1:250 for house plants) on their label, which is certainly a safe bet – never hurts to go more diluted. I’ll update my instructions up above at some point. Hi Phil:Have any of your products been used on bonsai plants, or have you had inquiries from bonsai people? How would I use your products for bonsai. Would your products be too acidic? Thanks. Good question Charles. I’m not very knowledgeable about bonsai, and haven’t had inquiries. The mycorrhizal fungi would be useful. I think a dilute solution of the seaweed and/or sea minerals would be useful too, as well as effective microorganisms, which seems to have the potential to be universally helpful. As for the fish, it may very well be helpful, but I don’t know if the big hit of nitrogen is necessary for most bonsai plants – that’s why I lean to the seaweed/ocean water. What is the best fertilizer for a jacaranda tree. I wanted to buy the fish fertilizer but it has high nitrogen and I was told too much nitrogen makes jacarandas not bloom. My jacarandas are not blooming. There’s actually no such thing as a ‘best fertilizer’ for each tree. The best fertilizers are the ones that fix the deficiencies in the soil and tree. But I will say that fish is fine for your tree. It has a small amount of nitrogen, not too much. It also has phosphorus and many other important nutrients for blooming. Hi Ivy, good question. Whether or not your plants will get enough P from the soil depends on how ‘available’ the P is in your soil. The soil tests that I use will tell you that, but most soil tests don’t. The bottom line, though, is that the small amount of P in fish fertilizer is not going to cause any excess, so it’s still 100% okay to use. Thanks very much for your response, Phil! I do not see on your website anything about the soil tests you do (pricing, etc). Where can I find it? I think I’ll send some soil in to you next spring – or perhaps this fall would be better. I don’t do them Ivy. I recommend that samples be sent to organic labs such as Crop Services International or International Ag Labs.